Has RealClimate or its commenters weighed in on Goodell’s RollingStone.com piece on Richard Alley’s views about worst-case scenarios for near future sea level rise? And did Alley mean it could happen potentially by the end of this century? Arctic sea ice extent is now the lowest in recorded history, more than 2 standard deviations from the historic norm. Anyway, that leads us to what you got right, which is that a statistically significant result tells us that there is a trend. But, that is the only question that is answered; it tells us nothing about what caused the trend. So, at this point, you are not asking what you call a “relevant” question about the hypothesis itself. OK, I will now answer your perfectly fair question about my range of confidence. About six months ago, a Boeing 737 Max crashed. If I had been in charge of aviation authorities, based on the characteristics of the crash, understanding the physical parameters of the airplane, and hearing anecdotal (not statistically significant) evidence from pilots… I would at least have issued a world-wide alert and made every effort to ensure that pilots would be aware of those two little switches that could turn off the MCAS system. Now, at the cost of a bunch more dead people, we have two data points, and the aircraft is grounded. Is two sufficient, statistically? So, I’ll give you one more question, which relates back to my very first comment, I believe. You agreed with me that it was likely that increasing the energy in the climate system would change the behavior of the Jet Stream. But that leaves us with a simple choice. Will the JS get more wavy, or will it get less? Or, are we both wrong, and it will not change at all? Which is more/less likely, and why? After 2 weeks below +3.0 ppm CO2 growth at MLO this week to date is back above +3.05 ppm already. To assume the above avg CO2 MLO growth (and the dips) this year is being driven by El Nino appears to me to be counter-intutitive and contrary to the historical records / patterns of previous El Ninos. Maybe something else is going on at MLO and with global CO2 levels? Maybe given the obvious examples of changing global climates (atmospheric and ocean patterns) it’s surely not too surprising if the ENSO climate dynamic itself might already changed as well? While the majority sit back and wait for a Paper to be published about that in years to come. JAXA is a little less smoothed thn NSIDC and is also showing SIE at the lowest-for-time-of-year. The JAXA data shows it is the biggest ever negative anomaly for the early part of the year, sitting at -860,000 sq km (base 2002-15). Previous years never made it under -800k sq km until mid-May. And that was the crazy 2016 year. Indeed 2016 was the only year that had any anomaly under -800k outside the height of the melt season. Note that the maps will update, but they were current as of writing. Moreover, the Arctic’s expected to stay warm for a while, according to the 3-, 5-, and 10-day outlook maps on the same site. The dawn of Peak Predictable in climate politics calls for change in Climateball blogs. First, we weren’t discussing the GMST, were we? Second, is it your opinion that a 28 year time-series demonstrating a jet stream trend would be insufficient? Anything less than 30 just won’t do? You mean I got something right? What a relief! Let me get this straight, we don’t know for sure if there even IS a trend, but I should have asked what caused it?? Hmm.. Your last question (paraphrasing), “will more energy in the climate system make the jet stream more or less wavy?”, is very interesting. Although I like the “lazy” hypothesis, I don’t think a less wavy (faster) JS is out of the question. More on that later. Both JAXA and NSIDC are lowest values for this date, but it is still very early in the melt season. Others years have shown greater early season melt (i.e. 2002), but did not amount to another out of the ordinary. Some speculation is that the increase in winter ice this year was thin, first-year ice, which was relatively easy to melt. 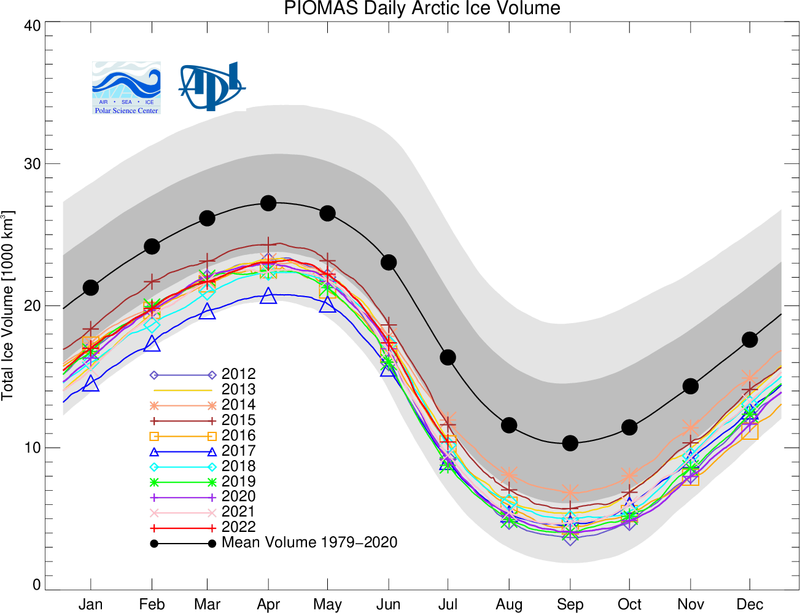 PIOMAS volume shows relatively higher values than the previous years, indicating that the remaining ice is thickness than the past few years, and will be more difficult to melt. We shall see. RSS has posted the March 2019 TLT anomaly at +0.71ºC, a shade up on Jan (+0.67ºC) and Feb (+0.65ºC). March 2019 is the 3rd warmest March in the RSS TLT record (5th in UAH), sitting below March 2016 (+1.08ºC) & 2010 (+0.74ºC), and above March 2017 & 1998 (both +0.60ºC). March 2019 is the 15th warmest month in the all-month RSS TLT record (=43rd in UAH). As a start-of-the-year, Jan-to-Mar 2019 is the 3rd warmest on record behind El Niño years 2016 & 2010. 4th warmest RSS start-of-the-year is 2017. All 2019 months-so-far have higher anomalies than any 2018 month. So far, 2019 averages +0.68ºC which is higher than any full-calendar-year-average with the exception of 2016. A second-warmest-year-on-record accolade for 2019 begins to gain serious credence. Is that how one graphs being ‘Fractally Wrong’? Are you going all skyrockety over the sea ice numbers? With no el nino in sight the last 6 to 12 months the CO2 still seems unusually high (above recent avg of 2.4 ppm growth) since January. And now there is an el nino in sight soon with a BOM alert for 70% chance of an El Nino forming mid-year or later this year. Leading me to expect even higher CO2 growth numbers in the second half of 2019 should this el nino happen. Need to wait and see, of course. 12,972,565 km2, a drop of -40,024 km2. What’s a ‘perfect storm’ look like? Record high CO2 levels, record low ASIE, record high fires, record high floods, record high ocean temps, record high fossil fuel use, record high global temps, record high costly impacts combined or something else? I think the moderators may have been kidnapped. Here’s a thought. Just shut down this forum for posting comments. There’s been no comment or article updates for 4 days now – and given only 3 were sent in it makes it 5 days without any updates being posted. It would really save many people a lot of wasted time and would be more respectful of everyone. Like, just publish a new RC article once in a blue moon instead – create a mailing list and email ‘interested’ people on the rare occasion that happens. Even better, shut this down (lock it keeping the archive) and just publish new “articles” via Twitter or don’t even do that any more either. Or has this blog been retired? Too busy to update? Personally, I think it would be well to recall that this blog is not anyone’s day job. Speaking for myself, the result of their skill and generosity is a resource that has been of great value to me over the years, and I’m sure to many others as well. Kevin said that you appeared to be serious in discussions on a different blog, but unfortunately I am not seeing it. We’re back to “what’s the question?”, and you are unwilling to specify that. If the question is “is there a trend?”, then the answer is: “not according to the statistical criterion derived from the known variation in the data, if that criterion is 30 years”. Well, I look forward to your model of how the increase in global climate energy would result in a faster and flatter Jet Stream, according to the current understanding of the physics of the system. Mike: I think the moderators may have been kidnapped. AB: long, long ago. Actually, they have much more important things to do than babysit twits. I do wonder why they keep the comments sections open. The comment sections always detract from the site. Remember that discussions about climate solutions go here. Errr… that thread is closed. The Arctic SIE numbers have been quite dramatic over the last couple of weeks. This is best shown with a graph of year-on-year SIE anomalies (usually 2 clicks to ‘download your attachment’). The idea that such low levels of SIE will continue through to the headline September minimum SIE was not realised in the dramatically low SIE of June 2016 – do consider that the parts of the Arctic being melted move North through the melt season and weather can still play a big part in the eventual minimum reached, weather which still has 5 months to pay out. RSS did give a record high March TLT value for the Arctic (60N to 82.5N) but such high Arctic temperature anomalies tend not to last through th year. But who can tell what we should expect? There will be a lot of ice melting between now and September and then there will be a lot of freezing through to March. The “Hold on to your hats! !” comment is intended as a warning of drama within that Arctic cycle. How long will the present drama last? I would suggest a visit to Arctic Neven’s if you want opinion on that score. + 4.40 ppm on last year’s weekly average. This week will be above +3 ppm as well. These readings and the earlier ones in 2019 could not have been influenced by an El Nino – because – factually based on science – as yet none exists. Re: #9 – “Others years have shown greater early season melt (i.e. 2002), but did not amount to another out of the ordinary. 2002 did not exit the 2 sigma statistical envelope for the year. Currently we are 1 million square kilometers lower and well out of the 2 sigma statistical range. If 2002 had been this low it would have exceeded the 2 sigma envelope by about a half million square kilometers if the melt rates had remained the same though the year. Let’s review our argument: I asked if there was at least a 30 year trend demonstrating the jet stream has slowed ……30 years generally considered the minimum timespan to differentiate trend from random variation. I said the number 30 was somewhat arbitrary, and you disagreed. That’s when I asked the question above, so let me state it again more clearly: Is it your opinion that a 28 year time series showing a slowing JS would be an insufficient time frame for differentiating a climate change trend from random variation? Just two months ago the world record for fastest jet stream was set. Not exactly lazy, right? Whoops, should have been, “between New York and London”. Also, big thanks to Gavin. I agree with everything Kevin said, and very much appreciate this blog. I learned a lot as an eavesdropper, and now enjoy participating in the conversations. As we await the posting of GISTEMP for March, it might be worth metioning that GISTEMP will be using GHCN-v4 for the met station data. A beta version of the new GISTEMP was published last month and there is a page providing comparisons of GHCN-v3 & GHCN-v4. This comparison page does have me scratching my head a bit. The graph of “Comparison of the surface temperature integrated over the land using 1200 km smoothing. (12-month running means used)” shows values of adjustment in the 1920s dropping well below -0.1ºC. Yet using GHCN-v3 & the GHCN-v4beta versions of GISTEMP land temperatures, I only find it dropping to -0.05ºC. I wonder if the smoothing is still set at 1200km for the land temperature record. But then, whatever the reason, the denialists will be having their bit of fun with it. ClimateCal 1: Check out methanelevels.org, click on sea level. Pinch graph if your on iPhone to select appropriate timescale and see how far sea level has risen since 1900. Almost 1 foot already! Antarctic west and east peninsula is in the verge of breaking apart and the greenland melt is accelerating. You will find the graph looks very exponential. I predict those levels much sooner than end of the century. If humanity is still around to witness it. They have been nice enough to provide decadal averages, and I think that gives a much more useful picture of what is happening. 1. Turn off everything, and then click on the three decadal averages. 2. Now, start adding in the plots from 2011. I think this is a case where “eyeballing” is reasonable unless you want to wait for next year when they post the computed 2011-2020 average. What we see is that there continues to be a pretty steady decline in the ice, but no reason to expect some profound drama. As I’ve pointed out previously, there’s no physical mechanism to create a “tipping point”; radical changes would have to involve energy transport from the south through ocean and/or atmospheric incursions. Because of the complexity of the geography, it would be expected that the average for any year is strongly influenced by local effects, and we discussed one such case recently, although I can’t remember which year it was for. What is it about you and so many others on this comments forum, that you seem unable to stop yourself from twisting everything “some people” into a criticism, a put down or an insult of the ‘moderators/owners’ of the site and what they have done since 2008? Is it laziness or dyslexia or something else that drives such ludicrous interpretations? Which is what I was saying but unsaid because it is so patently obvious… WTF reason do you imagine the comments are not being updated regularly for ???????????????????????? DOH~! I have lost count of the number of times over the year I have given a hearty thanks to the MODS etc here … but you on the other hand probably saw none of them! April 13: 414.10 ppm = +4.64 ppm on last years weekly average. If you don’t understand that, tell me what you don’t understand. With respect to your Jet Stream references, I suggest you go back and read them over (carefully) and explain in your own words what hypothesis you think they support. Perhaps the commenter @37 suffers from some sort of calender worm infestation eating through the weeks of his record of 12-month MLO CO2 rises. It must be a hungry little blighter – it’s chomped its way through almost half the record of the year-so-far. You have not given an answer. The study I referenced had a clear, bottom-line hypothesis: the jet stream between New York and London is getting faster as a result of increasing levels of Co2 in the atmosphere. They said their opinion is based on model simulations and atmospheric physics, neither of which I would be able to explain in my own words. Not even close. They also noted world record breaking JS velocities had already been observed in that area (2015). As mentioned by me, a new world record was set in February of this year. The Bureau’s ENSO Outlook remains at El Niño ALERT. This means the chance of El Niño developing in the coming months is approximately 70%; around triple the normal likelihood. While climate models forecast El Niño-like ocean temperatures during May, most models indicate a cooling through winter, with only three of eight models still forecasting El Niño-like warmth in (SH) spring. This indicates that if El Niño does develop it is likely to be short lived and weak. Very glad to hear it. They deserve it. …but you on the other hand probably saw none of them! Possibly, as I try to avoid reading your posts for reasons that will be abundantly clear to most readers of your #35–a practice the implementation of which I obviously need to improve. GISTEMP has posted for March 2019, although seemingly not the first month with the Version 4 as v4 is still labelled as a beta version, so here I’ll stick with March 2019 v3. The v3 anomaly sits at +1.11ºC, a bit of a jump up on Jan (+0.87ºC) and Feb (+0.90ºC). March 2019 is the 3rd warmest March in the GISTEMPv3 record sitting below March 2016 (+1.31ºC) & March 2017 (+1.13ºC) while ahead of 2010 (+0.92ºC), 2018 (+0.91ºC) & 2015 and 2002 (both +0.90ºC). March 2019 is =6th warmest month in the all-month GISTEMPv3 record. As a start-of-the-year, the GISTEMPv3 Jan-to-Mar 2019 sits at +0.96ºC the 3rd warmest on record behind behind 2016 (+1.27ºC) & 2017 (+1.08ºC). This Jan-Mar 2019 compares with the full warmest-calendar-year (2016 +0.99ºC) and second warmest (2017 +0.91ºC), so with no big El Niño boosting global temperatures, I think we are possibly now venturing into “scorchyissimo! !” territory again. A paper just published & co-authored by one of our hosts Susskind et al (2019) ‘Recent global warming as confirmed by AIRS’ will be useful in unseating the zombie denialist argument about heat islands boosting the warming within surface temperature records. Mind, the AIRS data only covers 15 years which isn’t dissimilar to the length of period of the the original denialist’s “no statistically-significant global warming” assertion which often featured in the zombie denialist ‘hiatus’ argument. Re #42 Kevin McKinney said stuff. That is an intellectually lazy post, Kevin. I also interpreted Carrie’s post as you did, but after her retort I read it again with that retort in mind, and it came across differently. Your post referenced herein seeks to dismiss any utterance by Carrie, and that is not justifiable. Do you understand regenerative systems, Kevin? You seem all too willing to cast allies into the trash bin. Let me ask you, if the only doctor in town is also a misogynist, do you try to work with it or let people die by casting him out? Yes, that’s kind of my point. I think it’s great that you are interested in this stuff, but it isn’t clear to me what you understand about any of it… I don’t mean at the level of building climate models, but about language like “hypothesis” and “vectors” and “arbitrary”. That’s why I am asking you to explain why you think my answer is not an answer. You seem to think we are having “an argument”, but you haven’t articulated any support for your position… and the fact that you use the term “somewhat arbitrary” makes even what your position is unclear… is that like “a little pregnant”? The question is whether you disagree with my “opinion”, which I carefully stated, or simply don’t understand the words. The article by Williams is in itself quite interesting, but again, I wonder if you can go further on it than the fact that it has the words “fast jet stream” in it, so you got a hit when you typed that into a search engine. Did you read the whole article, and the reference that he gave that is accessible (Woolings and Blackburn?). Did you learn anything in either that you could put into your own words? And NOAA has also posted for March with a bit of a jump up for the March 2019 anomaly, +1.06ºC, well above Jan (+0.88ºC) and Feb (+0.78ºC) and actually the highest global anomaly since April 2016 and indeed only exceeded/equalled by the five months at the height of the 2015/16 El Niño. (Last few years’ graphed here – usually 2 clicks to ‘download your attachment’.) March 2019 is the 2nd warmest March in the NOAA record (3rd in GISS) sitting below March 2016 (+1.24ºC) while ahead of 2017 (+1.03ºC), 2015 (+0.90ºC), 2018 (+0.86ºC) and 2010 (+0.84ºC). March 2019 is =5th warmest month in the all-month NOAA record (6th in GISS). As a start-of-the-year, the NOAA Jan-to-Mar 2019 sits at +0.91ºC the 3rd warmest on record behind behind 2016 (+1.17ºC) & 2017 (+0.97ºC), this as per GISS. This Jan-Mar 2019 +0.91ºC start-of-year compares with the full warmest-calendar-year (2016 +0.95ºC) and second warmest (2017 +0.91ºC), so again as per GISS. I think it’s worth a “Scorchyissimo! !” rating. Now, instead of answering you’ve decided to challenge my language skills……lol. – A record wavy JS is consistent with the hypothesis that CO2 will cause the JS to get more wavy. – A record fast JS is consistent with the hypothesis that CO2 will cause the JS is get faster. – A record cold snap is consistent with the hypothesis that low solar will cause the planet to get colder. “Consistent with” is what people point to if they can’t demonstrate a trend. Doesn’t do a lot for me. Time is a limited resource. One makes one’s best judgments, or tries to.